Last Sunday, Grant participated in the Belgrade Regatta with our 75-year-old neighbor; I was voluntold to drive. The Belgrade Regatta is not a regatta in the normal sense, in that the point is not to race. Basically, lots of people pile onto rafts (or anything else that floats) and float down the Sava river for six and a half kilometers, eventually landing on the island of Ada Ciganlija. The end. It takes about three hours and does sound like a lot of fun to me, and I know Grant enjoyed it. Apparently they have a barge that travels downstream with them, plays music, and has drinks. Participants are free to jump and swim from one raft to another and just have a good time in general. Of course, some people are less than thrilled to have drunk teenagers splashing and jumping all over them, but the teenagers certainly have a good time! I’m wondering if we should get an embassy group together for the Belgrade Regata next year. Following the float down the river — for the rafts that fall behind, whether it is because the occupants have no idea how to use paddles or whether they have no inclination to do so, organizers will sometimes tow them via motor boat, so that no raft falls too far behind. Following the regatta, lunch is provided and there are other events, such as beach volleyball, that people can choose to do (or not). While they were floating down the Sava, I was sunning myself on the Ada Ciganlija beach and quite enjoying myself. Later, when I went to pick up Grant and our neighbor, we had an additional event of our own to attend. Our neighbor had set up a boat ride for us with one of his former neighbors. He had mentioned this before, but both Grant and I had been expecting some kind of old, rusted dinghy… and not the giant motor boat, complete with sleeping quarters and bathroom, that greeted us. We were taken on a cruise down the Sava, to the Danube. It was both decadent and fantastic. 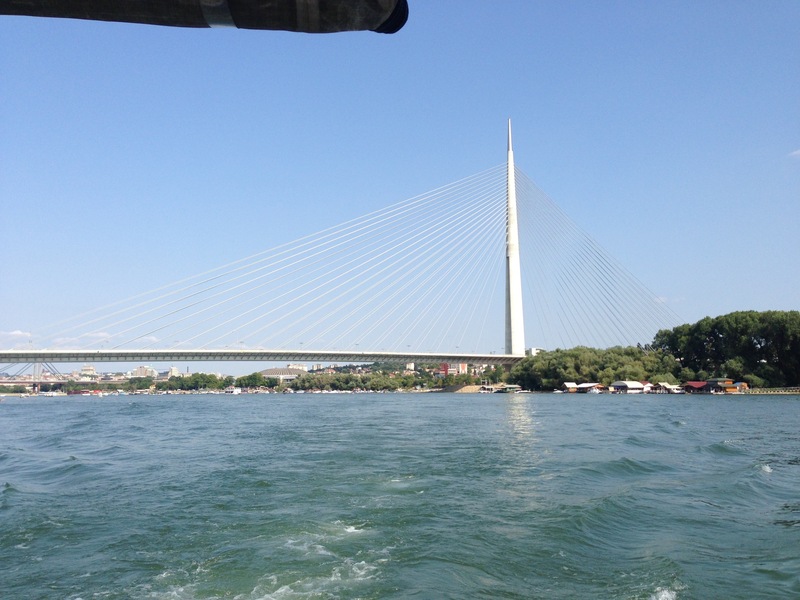 As soon as we arrived onboard, the owner introduced himself and asked us what we wanted to drink; so, white wine in hand, we cruised the rivers surrounding Belgrade. It was wonderful and we really liked making new friends, in addition to enjoying ourselves. Serbs are very welcoming people and I can honestly say that even though we’ve just about hit the two and a half month mark, I am still loving Belgrade and Serbia as much as ever! Ah so this explains that instagram on the boat! Very cool!